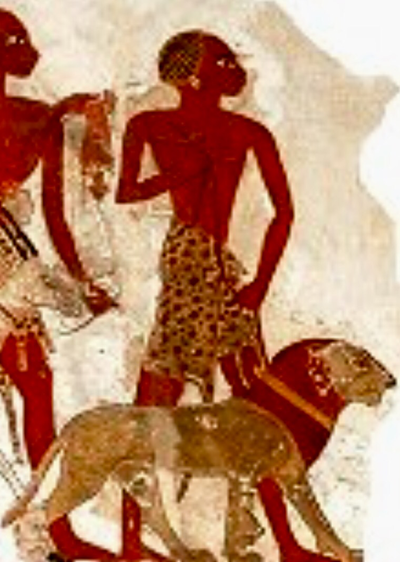 The ancient Egyptians loved their cats, (both wild and domestic) so much so that they even regarded them as sacred. Many artifacts depict their relationship with lions, cheetahs, servals and caracal. For the most part these animals are featured in the wild, but there are also instances such as the murals above where a cheetah, lioness and male lion are depicted as domesticated animals on a leash. 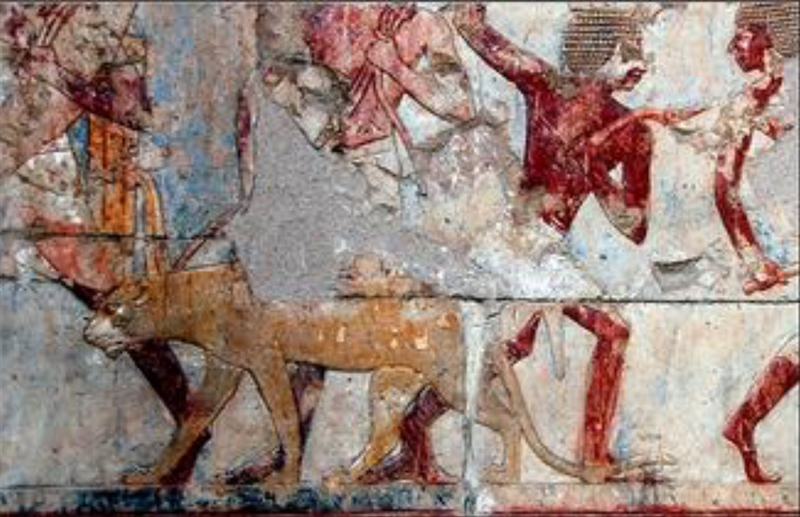 Another mural exists where a Pharaoh is seen hunting with his lion. 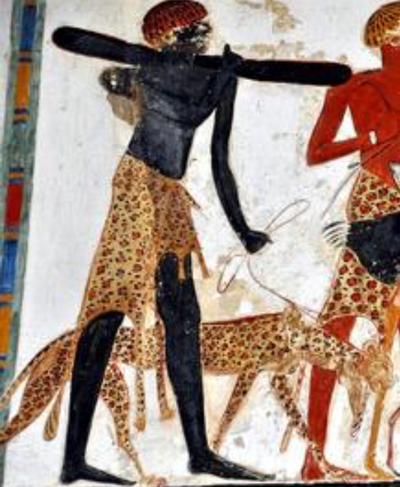 Why would the Egyptians have done this? For centuries humans have had an innate need to interact with animals, both domestic and wild. As Stanford University scholar Mackenzie Cooley's research concludes, "People in the early modern era lived in close proximity to animals, and our language preserves relics of that time" for example "an elephant never forgets". "Having pets as our only reference to the animal kingdom sentimentalizes our view of animals and thus impedes our appreciation and stewardship of the natural world", Cooley argues. 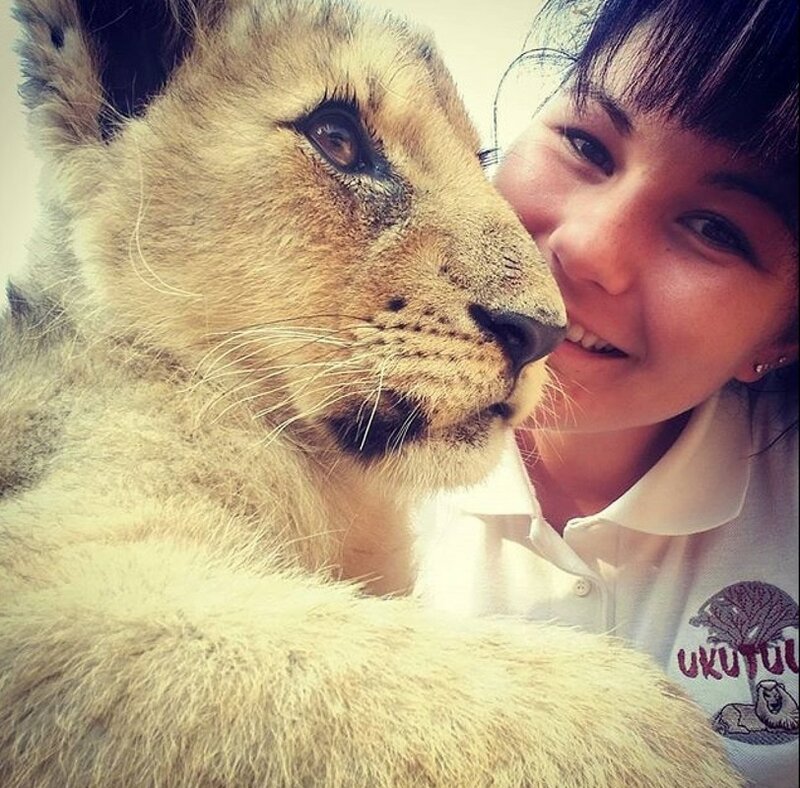 Ukutula passionately believes in this historical relationship between humans and wild animals as well as the expansion of reference beyond that of pets. "Exploring the powerful ways in which people have related to animals restores depth and nuance to our view of nature." Indeed, an Ukutula experience provides any volunteer with a new outlook on preservation, as well as a depth and nuance to our view of nature that Cooley promotes. Sadly, recent history has given rise to a school of thought that is expounded by animal rights activists (who don't work with wild animals daily) and who tend to group wild animals as a cohesive group when deciding what they think is right for all wild animals. For them, any and all contact with wild animals and humans is decried and to be outlawed. Individually we have to decide where we stand in terms of this question, but such decisions are best made in a balanced, calculated way, based on an unemotional consideration of fact backed by science. The moderate voice of reason is balanced and does not use social media to constantly attack those with a different opinion. Imagine if all the hours spent on attacking sincere conservationists on social media were rather utilized in productive contributions for all the wild animals on the verge of extinction! I believe it must first be understood that this question falls into the same category as questions such as "is it good or bad to have a gun for protection," or "is religion a good or bad thing for society." These questions share a common thread: it depends on how they are used. Certainly we humans have a profound ability to corrupt good ideas and goals and turn them into a negative result, if the motivation and intentions of the particular person or group is self-centred and/or driven by desires not beneficial to society or, in this case, the animals affected. The first question to be asked is "Why?" What is the purpose of any proposed interaction or desire to develop a relationship with a wild animal? If the purpose in having interaction is to benefit the animal, it must be a completely positive experience for the animal; otherwise there is no purpose under this category or reasons for interaction. That means one must start with the proper experience, knowledge, and motivation. Without all of these qualities, it is a recipe for failure, or worse-injury. One must know which individual would probably benefit. Since wild animals do all have unique emotional characteristics just like us, some individual wild animals can't be trusted by even the most experienced human and perhaps don't want human contact. Next, the human must know what activities and interaction will produce positive emotional benefits, and the human must be motivated only for the benefit of the animal involved. If one has any other purpose for the interaction such as ego gratification, desire to dominate, or to show off to others, the animal will probably not respect or trust the human and it will not be a positive activity for either party. In fact, someone with improper motivation will most likely end up seriously injured, and the animal will also suffer as a result. It must also be emphasized that positive interaction does not have to take place in unprotected contact with a wild animal; many of the benefits of emotional bonding and trust can be achieved from protected contact through a fence. ....I and many others that have close relationships with wild animals realize that they are as individual as are humans. For instance, the statement often heard that all wild animals would be better off in the wild than in the best conditions of captivity is too confining. Just as all humans don't want to live in the wilds of Montana-or live in the confinement of an apartment in New York City-so too do wild animals differ in what makes them happy, based on their individual personalities. It has been illustrated time and again that we humans only care about preserving those animal species with which we identify in a positive and caring manner. Examples such as dolphins, killer whales, panda bears, koalas, and wolves illustrate the value of human caring. And, even some of those species are having difficulty surviving because of habitat destruction, poaching, commercial activities, and conflict with agricultural and developing interests. While I consider myself an animal activist, I also have a pragmatic understanding that appropriate venues are necessary to enable the public to identify with individuals of species-particularly carnivores and large wild animals such as bears-in order for the public to take an interest in their treatment and survival. If we didn't become attached to "Flipper" many years ago, where would dolphins be today? And, if we didn't become attached to "Shamu" and his many incarnations, what would the fate of killer whales be? Many wrongs have been committed in the attempt to use animals for entertainment, including past inappropriate activities.... Add to those obvious infractions the following inappropriate, and stressful activities such as: photo shoots with the public in close proximity or holding wild animals, taking wild animals on television shows where they are ridiculed or used only as props for jokes, walking large carnivores on a leash in proximity to the public, and allowing the public to fondle and pet wild animals that are confined-and there is plenty of ammunition for those animal rights activists that want to ban all venues using wild animals. They characterize all these activities as exploitation and inappropriate use of a wild animal. Many of them are. These activities send a wrong message to the public and perpetuate the treatment of animals as objects to be utilized in any manner we choose for entertainment. The appropriate venues that do treat wild animals with respect and utilize natural behaviour are cast in the same light, because the majority of uses are the inappropriate ones. Therefore, the opportunity to educate the public about treating wild animals with the respect and dignity to which they are entitled, while getting the public to identify with them, is being questioned, and we have "opportunities lost." First, the organization developing the interaction must carefully select individuals within a species that are temperamentally suited to activities involving masses of people. Each animal is an individual, and some wild animals like solitude, while others can enjoy interaction in front of a crowd if they are treated with respect and concern for their welfare and comfort. Next, any interaction should be designed to display the particular species of animal in a venue that allows it to use its natural behaviour in a manner that the public enjoys but is also pleasurable for the animal. As far as exotic cats, this would involve a natural setting wherein the cat would chase lures or other objects, perhaps climb trees, and leap from object to object. Properly done with the right cats, this activity can be fun for the cats, if they are treated with the proper respect and concern for their comfort and welfare. In addition, it would educate the public about their playful and sometime affectionate nature, while at the same time showing that any use of a wild animal should involve activities that the animal finds enjoyable as much as the public. In summation, well-planned and well-executed interaction between human and animal can be a constructive and positive activity for a variety of reasons. Not the least of which is that hopefully future generations will grow to accept that all higher beings on this planet are entitled to some rights and concerns for their emotional needs and rights....Only dedicated individuals embarking on a lifelong journey to learn about the animals on their terms and with respect of their instincts and needs can bring that recognition about. Necessarily, it will take interaction and understanding to achieve those results. Mistakes will be made. People will be injured. Has any achievement-including the struggle to establish equal treatment of all humans-taken place without those very same sacrifices?" Aptly, National Geographic, in celebrating almost 1 million followers on their Instagram account chose to highlight this very attribute - we depend on animals as much as they depend on us. The celebration included photo's of touching moments of the bonds between animals and us humans. Ukutula passionately believes in sharing these valuable experiences with as many humans of all income levels as possible in order to create an appreciation and awareness of the need to protect the preciousness of our natural assets in nature, as opposed to the limited exposure the privileged and wealthy few may have had in their exposure to wild animals in the past. However, notwithstanding all of the aforementioned benefits to humans based on scientific studies, the primary reason for human contact with the lions, cheetahs and tigers at Ukutula still remains research, education and survival of the species. We are grateful that such fulfilling secondary benefits arise out of this relationship. 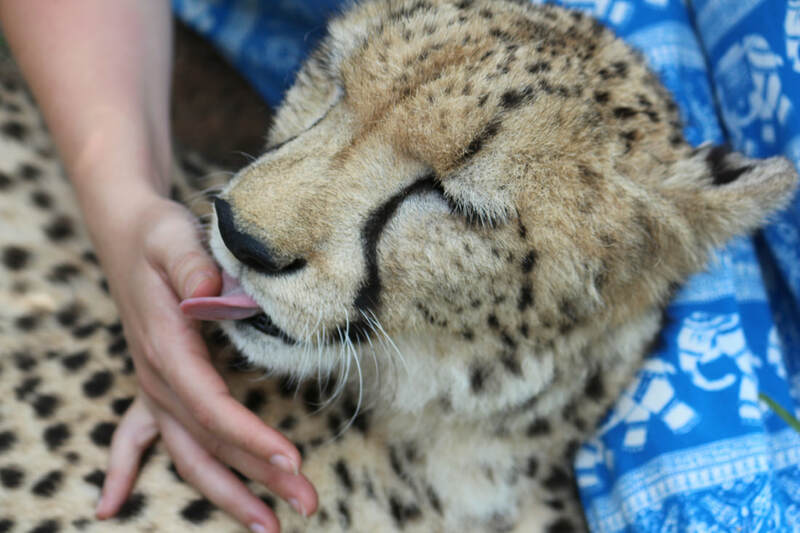 The cheetah will lick your legs, your arms, your hands and even your face if it can! At first it is a bit of a shock - the tongue is a great deal more course than the domestic cat! It is a very special experience and establishes a very special appreciation and connection with these regal cats. On the other hand, if you were to somehow let a lion lick you, you would possibly not only lose your skin, but your flesh as well! 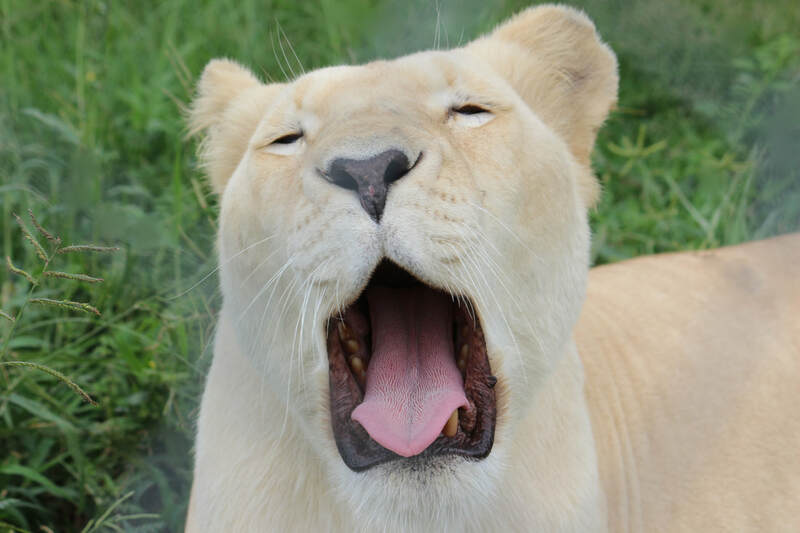 That roughness you see on the tongue of the white lion in the photo is called papillae and is comprised of organic spines which have several functions. 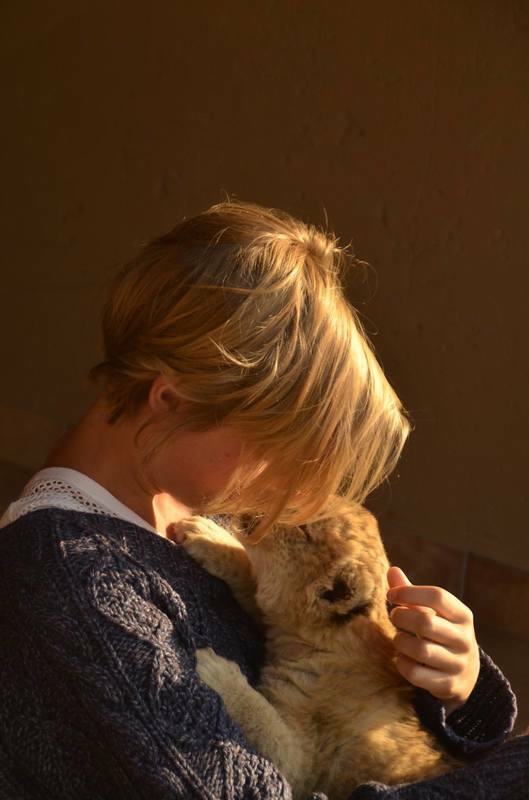 Volunteers at Ukutula get to observe that lions are extremely conscious of grooming - both themselves and one another. This rough tool can primarily be seen in cleaning the bones of their food from every morsel of meat. Just like domestic cats, lions are meticulous in keeping themselves clean for their health and hygiene and the tongue acts like a hairbrush on themselves as well as one another for hours every day. This all contributes toward maintaining a neutral smell for hunting, as well as being a powerful tool in their bonding as a pride.